« Jan Fennell is a Training GENIUS! We couldn’t find any information about Havachons anywhere, so we looked up info on Havanese and Bichon personality traits, figuring Daisy would probably be a mixture of both. And she certainly is, and then some. Since there isn’t any good Havachon info online, we thought we’d post some so you aren’t facing the same blank wall we were. 1. SMART. Maybe too smart. Loves to outsmart humans and figure things out. 2. Stubborn. Unless and until a Havachon recognizes you as her leader, she’ll do things her way over and over again until she has YOU trained. 3. Willful. It’s her way or the highway, baby. She’ll pursue areas that are off-limits until she finds a way to go there, then she’ll flash you a “see-it’s-mine-now” look. That is, until you teach her who’s Alpha. 4. Loving. Oh, so loving! Havachons become little puddles of mush in your arms, with their soft doe-eyes, frantically wagging tails, and kisses galore! 5. Shy. In certain circumstances, like taking them somewhere new, they can be a bit leery and want to take things slowly at first. But once they trust you, they’ll look to you for guidance and listen when you tell them everything’s okay. 6. Playful! Very playful! They tend to play pretty hard, which is surprising for such a tiny dog. They play like they’re 50 pounds bigger than they are. And their sharp teeth go through everything, from Kongs to Nylabones. Our Shepherd-Husky-Collie mix didn’t shred toys like these little guys do! 7. Cuddly. They just LOVE being held, cuddled, and sleeping in your lap. 9. Friendly. We were told that Havachons were shy about meeting new people, but we haven’t seen any examples of that. Daisy is always very happy and excited to meet new people and new dogs. 10. Ham. LOVES to have her picture taken. She’ll actually freeze in place when she sees the camera pointed at her and wait until she hears the “click” before she continues whatever she was doing. 11. Curious. They’ll check every nook and cranny a hundred times just to see what there is to see. Very thorough. This is definitely a wonderful new mix that I’d recommend to anyone who has the energy to get through the puppy period! This is such a great post! It’s most useful to hear traits of a breed from a real person who owns that breed instead of a dog breeding website. They tend to say the same things about almost all breeds…I also like #10!! I have a 4 month old Havachon and we are in love with him. He is the best dog we ever had. I didn’t know what a Havachon was and when I tried to find information, there was so little. I agree with your summary of the personality traits of a Havachon. He is a part of our family and is with us as much as possible. Thanks for visiting Michele! Yes, Havachons are the sweetest little puppies and very loving too! You’re right, there’s no real info about them out there, which is why I started this blog – to help other new Havachon owners or people considering getting a Havachon understand them a little better. Best of luck with your little bundle of fur! Nice to meet you Tracey! I agree – of all the dogs I’ve owned (and I’ve loved them all), our Havachon is definitely the sweetest and most lovable. “Precious” is a perfect description! Hi! I so love your description of life with a Havachon. We have a 1 yr old, Bailey and she is without question the sweetest pup we have ever loved. I am looking for a havachon, but they are hard to find around here. I live in byron Center, Michigan. They’re very uncommon here in NJ too, but I was told by a breeder in upper NY state that they’re much more common there now. Maybe you can find some breeders there? Our Havachon was bred in Kentucky. We’re on the east coast – here, not too many places carry Havachons yet. They’re a new designer breed, but I’ll bet we’ll be seeing more of them as time goes by! http://www.westcoasthavachons.com there are soom cute pictures of our babies .bragging right allowed RIGHT ???? LOL They’re adorable Margie! You make some very good points here. It’s always important to check a puppy’s background first as well as the breeder’s; I think it’s awful how some breeders are just in it for the money and don’t care if they overbreed their dogs. I’ll never understand how anyone can abuse an animal like that. Hi!!! new on this site. I have 2 (well really 1 the other Havanese girl is way to young to be bred) .We are very small and our Dogs have no idea thay are dogs. we love and care for them as pet children.They had to earned the right to be free in our home (potty) and sleep at the foot of our bed but even if its a king size they choose to sleep in their crates,next to the bed . I love this site. a buyer of our Havachon baby sent this to me (thanks Gloria) I read what the puppy owners had to say (very well done) and realized your right!!!! . We as breeders havent had that much experence with havachon as adults . (except when they come and visit us ..We love seeing the changes in these babies..You see you cant breed a Havachon to a havachon . thanks for the education everyone … hugs from us. Thanks for all the info. I have a 4 month Havachon that we also named DAISY! she is everything you have mentioned. It’s funny cuz I always said she’s a 50lb dog stuck in a 3 lb body. Do you know how big havachons get? Or is it just dependent on their parents? It seems ours will be pretty small even though her parents were 8 and 10 lbs. Hi Oriana, and thanks for stopping by! It’s always nice to meet another Havachon owner, and especially one with another Daisy! Hi, my Zoe is 3 years old and weighs 12 pounds. Vet said she is a little bit overweight. So, we have cut back on the treats. That’s interesting – my vet said our Havachon should be between 12-15 pounds, but no more than 15. So far we’ve been able to stay in that range. I just got a 10 week old Havachon puppy from a breder who could not sell him because he has a Heart Murmur I have had him 2 days now and you would never know is to look at him he has anything wrong other then he tires more easily. The night I brought him home he pottied on the floor twice and had to be corrected now he only goes on his potty pads or outside so he’s super smart very impressed with him already. Your site was very helpful and I have already seen some of these traits in my puppy. I am thinking about buying a Havachon. Can you tell me any negative about the breed. How was potty training? Hi Michelle, and thanks for visiting! Sorry for the delay in getting back to you, but I was on a blogging hiatus for the holidays. 🙂 As to your question, we found potty training a bit difficult because Havachons do have a strong will and can be stubborn. That said, once we finally got our pup trained, she stayed trained. It took between 9-12 months for her to be completely housebroken, though the first three weeks were the roughest. After that, she had the general idea of what she should do, but she wasn’t consistent until the 9-12 month time frame. One point I can’t emphasize strongly enough is that Havachons respond best to positive training, probably because of their strong wills – using treats as a reward trains our dog very quickly; this breed is VERY smart. We used Jan Fennell’s training methods, which work very well for Daisy. Consistency is key, because Daisy will backslide and try to do things her way if we aren’t consistent. Three discipline techniques Jan Fennell suggested that worked very well for our Havachon were: using a sharp noise such as a whistle (we hit a metal pot lid with a spoon) when the dog misbehaves stops her on the spot – they don’t like sharp sounds; designating a room as the “naughty room” where you put the dog for a few minutes when they’re naughty worked well too because Havachons are cuddlers and want to be close to you; turning your back on a Havachon and refusing to give them attention or look at them for a minute when they misbehave also works well. THANK YOU! We just bought our Havachon home today!! He is so cute (writing this before our first night!!!) and adorable, We named him Drayton and purchased him from a breeder in CT. (she still has more) She mainly has bichon frisse and when we called and gave her information on our family, she was quick to recommend our puppy (1/4 Havanese and 3/4 Bichon). Looking forward to seeing how he grows :). Congratulations on your new puppy! I’m sure you’ll have lots of fun with him – if you ever post pics of him, let me know, I’d love to see them! Daisy was very shy and quiet when we first brought her home, but once she got more comfortable in her new home, her personality emerged and the fun began. 🙂 These are really smart pups and you’ll start to understand each other soon (you’ll see what I mean as time goes on!). Hope you enjoy Drayton as much as we enjoy Daisy! Hello, I am the proud owner of a 13 month old havachon. Riley is a wonderful dog. He has the energy and sportiness of a retriever in a 15 pound, fluffy body! He is smart and playful but definitely has a dominant personality. We found a water squirter was the ideal deterant for negative behavior. We just have to pick it up now to stop him in his tracks. we “potty” trained him easily by teaching him to ring bells hung on the door when he needed out. He has never been shy, and prefers not to be alone, but is able to stay alone for 6.5 hours a day without signs of stress. He chews anything and everything so an abundant supply of suitable “chewies” is a must! I hope you enjoy this fun, lovable mix breed as much as we do! Riley sounds great – a real Havachon! Yes, we adore our little Havachon and we’re enjoying every minute with her. I hope to see more of this breed, it’s a wonderful mix! I just my Havachon home yesterday . Loveeeeee it so much already . fell in love with himas soon as I saw him. call him AERO. He is my first dog of my life . I know nothing about dogs , how to train them and so on.. Wish to learn , learn for him. Nay hints , point s, guidance are welcome . He goes for Potty quite a few number of times, is that normal? how much should I feed him? he is running 12 weeks now . The best way to start out right is to take Aero to a good vet (avoid the “corporate chain vets” like Four Paws, who nearly killed our puppy [https://raisingdaisy.wordpress.com/2010/07/22/the-vet-that-nearly-killed-our-puppy/]) – the vet can tell you how much to feed your puppy, what’s normal, and what to avoid. A good quality puppy food is important to get any pup off to a good start. There are also a few good training books and videos out that you can get from your library, bookstore, or online – we preferred Jan Fennell’s methods. They’ve worked beautifully with our little Havachon, Daisy. i was thinking of getting a friend for Aero. The idea of Aero being alone sometimes makes us sad . He is being pampered so much … Which breed of dog will be a good friend of Aero do you think? we wnat a similar type friendly, love at first sight dog ! but he has to be compatible with Aero, a Havachon. That’s a great idea, and another good thing to ask your vet. I haven’t done any research into what other breeds might get along with a Havachon – one dog is enough for us! LOL 🙂 Good luck! Which brand pf food is the best for Havachons? i want to change the food that came with my puppy. Please suggest . the groomer at pet store and also my vet said the food my aero has now is not so good and that might be making his skin dry. I would live to have a soft and silky fur on my Aero. pls suggest . there are so many brands available I am so confused … the food with lamb, chicken, turkey , duck, brown rice , potato mind boggling ..please suggest … Thanks So much . I have a question or worry. When I feed my Aero , after few minutes , he gets very very very active , runs around , almost like a crazy.. after an hour or maybe less he gets so tired , just lies down . i do not know , what is it , is it because he is small like 12 weeks old, or it is a sign of any problem ? or something to do with food? is it normal for puppies to get tired like that? whta brand of food do you feed your Havachon? Wow! So happy to have found this blog! We have had our new Havachon puppy whom we have named Saucy for about 6 weeks! She is everything you described but to the 10th degree! I am a retired hospice chaplain and I thought I would have the energy to handle a puppy… Holy cow! Willful, determined … You are sure right! Adorable, precious… And sometimes my husband and I wondered when she is tearing and leaping through the room if she might be just a bit possessed. She is hysterical. Yes, slow on the potty training . We also bought a back door bell but right now she would just rather eat it! LOL but she is a joy and we sure do love her, and such a show stopper she is on our walks! Thanks for this blog, …such an affirmation! Not so much laughing as smiling and nodding with complete understanding! Yes, Havachons are quite willful and always want what they can’t have. We used Jan Fennell’s training techniques; we liked them better than Cesar Milan’s because he likes a dog to feel subservient to his owner, and we don’t care for that. Jan Fennell’s techniques are simple and get results pretty quickly – her training makes the dog understand that you’re Alpha in the “pack”, which makes the dog respect you. We borrowed a ton of training books from the library and Jan’s techniques worked best for Daisy. You might want to see if your library has her books – I think last year she published a new one especially for puppies, but her other book, “The Dog Listener” worked just as well for us. We coupled that with Paul Owens’s DVD (also from the library) on training for things like “sit”, “stay”, etc. and his techniques worked immediately. We stopped Daisy from biting our pant legs and shoes with Jan’s technique – when Saucy bites your pants, you yipe in a loud, high-pitched tone like a dog would and turn your back on her. This is how dogs communicate “don’t do that again” with each other and it does get through. You keep your back turned for a minute – they don’t like being ignored and don’t want to continue the behavior that causes it. Daisy stopped biting within a few days once we started that. When Daisy would go after things she shouldn’t, both Jan and our vet recommended using a brief, sharp whistle burst to stop them because they don’t like loud sounds. We didn’t have a whistle and were desperate to try something immediately, so we hit a metal pot lid with a metal spoon. Boy, did that work like a charm! And take comfort in knowing that Daisy, though still feisty, did show some signs of calming down by age 2! 🙂 Hope these things help – let me know how you make out! your comment and advice are always so useful!!!. I find them so useful in raising Aero! One more advice .. how many times is a good number of times to give Aero bath ?some say once in 2 months , Petsmart people say twice in a month (is it because I take him to them for grooming and bath ? Generally what is good for them , with their kind of furcoat? can we use any pet perfume/deo.. or any other products to keep then clean, nice smelling , any alternative to giving bath? My vet also mentioned , more baths make their skin dry !!! Any suggestions /ideas..
Glad I can help! Every dog is different when it comes to the frequency of baths they need, so I’ll tell you what we do with Daisy as a starting point for Aero. Our vet had told us that because Havachons have hair instead of fur, they should be bathed about once a week (dogs with fur don’t need as many baths); of course, it also depends on the climate and humidity where you live. We found his advice to be right during the warmer summer months because Daisy can get a bit smelly by the end of the week (especially if she’s been outside a lot) and her hair starts getting oily. We bathe and groom Daisy at home, so through trial and error, what we found works best for Daisy is weekly baths in the summer and a bath every other week in the winter. Also, we use a moisturizing shampoo on her body and a tearless shampoo on her face and head (we haven’t found a shampoo that’s both moisturizing and tearless). With this frequency, we don’t do anything else in between to keep her fresh because she really doesn’t need it, so I don’t know about any pet perfumes or bath alternatives. Hope this helps! Thank you so much!!! Havachons have hair !! I always though that is fur !! See I learned again. I live in Toronto, it is a it cold here, but the frequency of bath is important piece of information. I think i have to adopt similar . Aero gets a bit smelly by second week , but then he is not outside so often . And when he is , he runs straight to the dug put soil in our garden . those days I strongly felt he needed a bath, but was scared to give him one . I feel so much better now after knowing Daisy gets a bath every week without harming the hair .In summer Aero will certainly need more frequent bath! We will be adopting a 8 week old havachon puppy in late dec. or early jan. we are sooooo excited even though she hasn’t, benn conceived yet. We lost our 16 year yorkie, alibear 2 years ago and are now ready to love again. Found a great breeder in FL and will visit her in a few weeks. Thanks for your blog…. I am computer illiterate. Daisy sounds like a lot of fun. I really don’t remember Alibear’s puppy taining as being difficult so we are hopeful this won’t be tto bad. It’s like waiting for a new grandchild but this one won’t say drive me, buy me or make this for me. Really do love our grandkids. Where do you all live? We will be leaving our Summer place in MD and heading home to Sun City Center, FL. I have a Havachon puppy, it’s our third week with her.Her name is Stella,and she is 10 weeks old and boy she is sweet but a hand ful. I have had many dogs and different breeds, she is right up there with our late airdale, I will try the book by Jan at the library, sounds like peope have gotten good results. I’m glad I found your site and will be following it on a daily basis. Thank you all I feel so mush better, I’m not alone! Jan No dont let her bite you in any way even just playing..Or teething She may be thinking that you are playing too. In a very low voice SPEAK NO! dont yell, this only makes them more excited. Thank you so much for your site! We have a havachon male who is 10 months old. His name is Talon. We have never had a dog like him before so we are learning as we go. Yeah potty training was rough but we survived. Now he is just one of the kids. We keep him on the same schedule as them. We love him and wouldn’t trade him for anything! Hi Kay and thanks for visiting! Havachons are such a wonderful breed; with all the dogs we’ve had, none were at all similar in any way to Daisy. It’s been a learning process as much for us as it has been for her, but we wouldn’t change a thing about this breed. Even their stubbornness can be cute! And they’re so loving, sweet, and smart. We’d get another one in a heartbeat. I agree Paulette, I don’t think animals should go through all that “human stuff” either. Thanks again for visiting! Hi Maddy! How exciting that you’re getting a puppy for Christmas! I know you and your family will love your little Havachon, they’re so very sweet and so much fun. Let us know what you name her! Love hearing about everyone’s experiences with Havachon dogs. I adopted my rescue dog in July 2013. She was rescued by a Bichon rescue group and her sponsor believed she was a Bichon Poodle mix of about 18 months of age. When found she had just had puppies and was turned in by someone saying they found her wandering the streets. I’ve had a full blooded Bichon and Haley is very different physically from a Bichon. She has big feet, heavy muscle structure in her legs and golden brown eyes and a brown nose and snow white curly hair. She has a magnificent personality. Her energy level is over the top. She loves to play fetch and patrols the back yard, chasing and barking at birds. She makes it her daily task to move the garden hose across the patio to the grass and does a number of other assorted activities while I’m at work. She is very smart and brings her toys into the house when asked to do so. She loves to sit on laps and cuddle and gives lots of kisses. She loves water and plays in water and mud both. I’ve been saying she is part “mud dog” but now after reading about the Havachon personality and experiences I believe she may very well be a Havachon dog. It sure does sound like Haley may be a Havachon, or at the very least, she probably has a strong mix of both Havanese and Bichon in her. A lot of people mistakenly think Havachons have poodle in them because of their curly hair, and if their facial hair is cut very short, their faces can take on a bit of a poodle look. Haley sounds like a wonderful dog and it’s so heartwarming to hear that she was a rescue who now has such a good home. I love your stories of her daily tasks, especially that she feels the need to move the garden hose every day! That’s adorable and so very Havachon! 🙂 Thanks so much for visiting. This is a wonderful site,so glad to have found it! We have a one year old Havachon named Vincenzo or Vinny for short.Previously owned a Bichon,really love both breeds. Vinny is sooo smart,sometimes too smart! He came home at 9 weeks,and slept through the night from that day forward.We also use the bell at the door,and Vinny was not difficult to train at all.He was a quick learner.Things were probably made easier for him because i am home during the day.So we were on a good schedule.Vinny shreds any paper product he can find,as well as ALL stuffed toys. He has the sweetest habit of booping you with his nose; does it if your just sitting down or walking.Kinda a little reminder that he’s there. Vinny is a little shy with people he doesnt know , so we just take a slow approach.Tell people to let him come to them. Our boy makes us laugh every day, he has an amazing personality! We love him to death! We live in Canada but flew to Idaho to get our little potatoe. He is one of Margies babies,who has written on here.The Havachons are wonderful dogs,i would recommend them to everyone. Vinny sounds adorable! Margie has some of the cutest Havachons ever, we would definitely want to get our next Havachon from her. 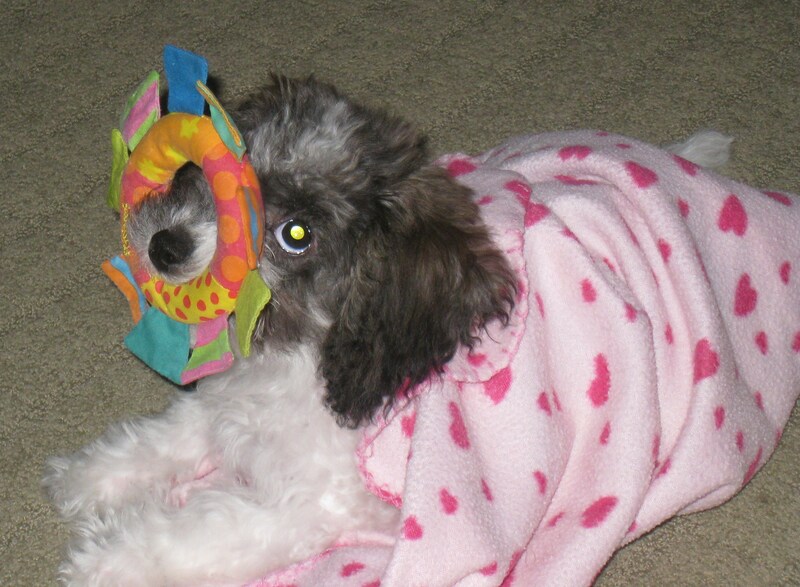 Daisy also used to rip all her toys to shreds, none were tough enough to withstand her teeth. But after she turned 2, she settled down a bit and plays more than shreds. She still looks for the weakest point, but she takes her time destroying them now. 🙂 There’s never a dull day with Havachons, they’re always thinking, always figuring things out – sometimes we can actually see her working things out in her mind and then changing her strategy. It’s an amazingly smart, sweet, and loving breed. Thanks for stopping by, I always love hearing stories about other Havachons! Hi Kim, and thanks for stopping by! We tried a few different training methods, but Jan Fennell’s worked best for Daisy. Apparently the strong Havachon personality does require them to view us as their “pack leaders”, and once Daisy got that into her head, she was much easier to train. We used Jan’s book “The Dog Whisperer”, but since then she’s come out with a new book that I believe is called “The Puppy Whisperer”. I haven’t seen it, but I’d definitely check it out for our next puppy. We didn’t follow every one of Jan’s rules to the letter because we did want Daisy to be a snuggly lap dog, but we did keep the basic “Alpha” training intact. One thing that we’ve found so important in training Daisy and keeping her on track has been consistency. As soon as we ease up on the “rules” – even when we had to when helping her through her two post-surgical recoveries – she immediately takes advantage and we have to retrain her. It sounds like more work than it actually is – Havachons are VERY smart and learn very quickly. I’d get another in a heartbeat. Good luck! Hi, is this still an active board? We have a 3 and a half month old Havachon named Rocky. We’ve always had big dogs (we currently have a 3 yr old Goldendoodle) so this little dog thing is very new to us. The potty training is the HARDEST by far. We’ve made some strides in that but it’s not easy. Our other dogs were easily trained within two weeks but not Rocky. We know it will take some more time so we’re just dealing with it but boy are we tired!! Lol. My beautiful sweet Bichon named Diamond just passed away from cancer and we are in need of feeling an empty spot in our hearts. We are considering a havachon but I have read that the havanese breed sheds so I’m concern about the Havachon shedding. We have allergies and so we always had a bichon or poodle. Does your havachon shed? I’m so sorry to hear about Diamond’s passing. I know how hard it is to say goodbye to a beloved family member. A Havachon is a great choice for you because they’re considered “hypo-allergenic” and don’t shed. We barely find a stray hair around the house a few times a year, and even when we brush her, the brush either has no hairs or only a couple. We also have a black blanket covering our sofa so Daisy can sit on it with us, and we never see any hairs left behind – she’s white and gray, so we’d definitely see them. There are never any hairs on our clothes after we hold her. My daughter also has allergies and hasn’t reacted to Daisy in the five years that we’ve had her. I hope this helps! My 5 mth old Havachon is extremely shy, skiddish, and lazy. He is extremely loyal to me(too much so, he ignores everyone else). I think he lived at the pet store too long before I purchased him. I am trying hard to get him to come out of his shell and also be more playful. We’ve had him a month and he almost seems depressed. Has anyone else had a dog act like this? Suggestions appreciated! Hi Jacqueline, Take a look at Jan Fennell’s books; she has one for puppies now. Her methods worked really well for us with Daisy. She’s a “dog listener” – she studied how dogs react to each other in packs and adapted that to human-dog relationships. Daisy picked up on those cues immediately when we used them, and it helped us help her with a lot of different things (like obsessive behaviors and misbehaviors like jumping on us too much). The information in her books can also help you interpret what different signs you’re seeing in your puppy mean. Jan didn’t have her puppy book out when we first got Daisy, but her book that we got still helped. I remember there was a section about a dog that was overly attached to one person in a family and eventually became too protective of that person. Her methods work really well as long as you’re consistent with them. Hope this helps! I just found your blog. I have a 3year old Havachon that I have named Zoe. I will be purchasing Jan’s book as I still have a problem with house training in the winter. There is only the two of us and she had become a little protective. When we walk, she becomes extremely agitated when we approach another dog, snarling on the end of her leash. However, is friendly when she actually gets close to the dog. She goes to the dog park and is very social with all of the dogs, when she is running loose. She loves all humans and jumps in the lap of anyone that will let her. She is such a bundle of joy. I noticed in another blog that a question was ask about the frequency of bathing. I have always bathed Zoe once a week, but have always used a pet conditioner after she is clean. She is all white, so a weekly bath is necessary. Looking forward to hearing more about the best little dogs in the world. Thanks Dee! Jan’s book did wonders for us with Daisy – she was hard to house train too. That was where her stubbornness really came out. We also experienced reactive leash behavior with Daisy (she didn’t snarl, but she did jump like wild and screech-bark at passing dogs), and we’re slowly working her out of it with treats, focus and positive reinforcement. I can imagine how sweet and friendly Zoe is, Havachons are a wonderful breed and such little characters! Daisy keeps us laughing with her little antics. 🙂 Thanks for visiting! Hello! I am so glad to have found this forum. I hope to have a Havachon in 2017. Looking for a Havachon breeder in Washington state. Can anyone recommend one? Thank you!! Oh how wonderful for you! I’m sure you’ll love your little Havachon. I live on the east coast, so I don’t know of any breeders in Washington. Wish I could be of help!